The newest additions to the Keyport Slide are available for pre-order, and boy are they convenient! Keyport thought of everything when designing all of the new add-ons, which range from the ultra-practical to the completely playful. Thanks to these ingenious designers, users can even open a drink in the dark while storing all of their data safely on a Keyport flash drive! The Keyport Slide has been technology’s answer to the huge bundle of keys that people lug around. Up until now it has allowed consumers to have up to six of their keys combined into one tiny unit (including keys with chips), which is about the size of a box of Tic Tacs. It eliminates getting poked and prodded with a bunch of metal sticks and sounding like one’s own high pitched percussion section with each movement. Keyport’s quick thinkers are taking convenience a step further by answering the public’s cry to have a good bottle opener, flash light and thumb drive handy at all times. Those folks who do not have the need for six actual keys can add any of these handy attachments. 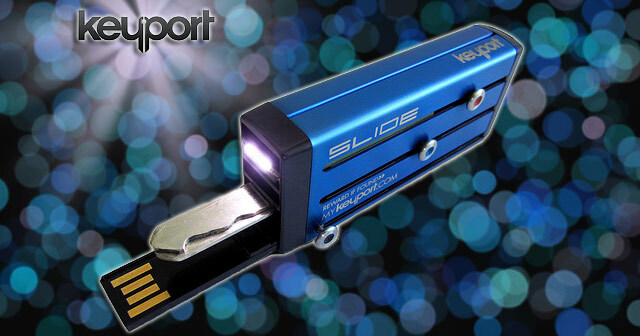 It is safe to say, though, that the Keyport Slide USB Key is the hottest add-on. You can now preorder their 4GB flash drive for about $19, or an 8GB for about $29. Those looking to purchase a new Keyport Slide with a thumb drive feature can begin with a $90 price tag. They will ship out on February 28th. Later this year, USB Key users will see another upgrade with the availability of a 16GB thumb drive add-on. Those who are concerned about the possibility of losing enough important items at once to bring about a deep depression can rest a little easier. All Keyport slides contain a serial number that is completely unique. In the event that the gadget is lost, all one need do to get a replacement is contact Keyport Customer Support. Tech minded folks can eliminate the worry of messing up their USB port with a really heavy attachment. Although the actual slide is pretty lightweight, one can easily remove the USB Key to plug in as a single unit. Keyport is definitely forward thinking when it comes to convenience, and they take their Slides seriously! Any flash drive user who wants to conveniently compartmentalize all of their keys and data could find the complete package with the Keyport USB Slide. Weigh in on the Keyport USB! Is this the kind of gadget that you’d like to keep handy or would you rather stick to the traditional keyring? This entry was posted in Articles, Flash Drive, Keyport, USB Devices, USB Flash Drives, USB Technology and tagged flash drive, Keyport flash drive, Keyport Slide, Keyport Slide flash drive, Keyport USB, USB, USB Flash Drive, USB Key, USB keyring. Bookmark the permalink.